Was Poi Pounder origin of Moai? 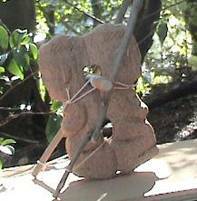 Poi Pounder is Polynesian traditional stone tool that pounds taro to get poi. Moai exists on Rapa Nui (Easter Island) that belongs to Polynesian cultural area too. 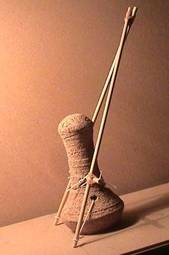 If a Poi Pounder is broken into two pieces longitudinally, then its shape is similar to Moai. Both of Poi Pounder and some part of Moai have concentric surface. 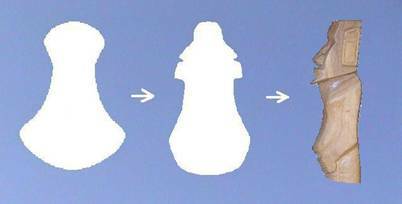 Both of Poi Pounder and Moai have not flat bottom, therefore Moai is easy to tilt forward. 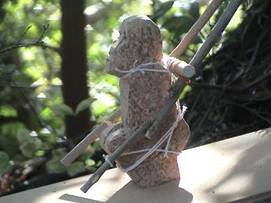 Both of Poi Pounder and Walking Moai repeat simple motion. At Bishop museum in Honolulu, I found a Poi Pounder that has human faces. This Poi Pounder was collected in Marquesas. And in Marquesas, there were also some statutes like Moai. 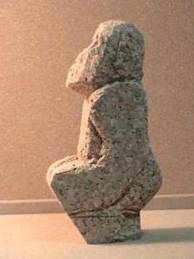 Was origin of Moai in Marquesas? I succeeded to make three models of figures to walk with using Miro Manga Erua. 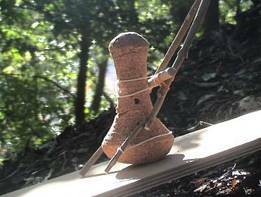 I think Miro Manga Erua was tool that move poi pounder up and down with using leverage. And it is possible that poi pounder started to walk on slope with MIro Manga Erua incidentally. I think that was origin of MOAI. The third figure is Tukuturi, the kneeling statue. This statue is kneeling at Rano Raraku in Rapanui. I think this statue’s side view is similar to poi pounder’s. 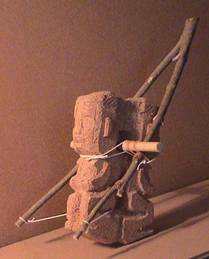 Rapanui is belong to Polynesian cultural area ,but In Rapanui, Poi Pounders have not be found at all . because Poi Pounder was sacred as origin of Moai.